Overview: A winter storm is developing for North Texas. I have been monitoring the data very closely for the past few days, and my concern is growing that a problematic sleet & freezing rain event may impact the area beginning Sunday night and continuing through Monday. On Sunday, temperatures should stay in the 40s as overcast thickens. A surge of Arctic air will move in Sunday night, with temperatures falling into the 20s by sunrise Monday. At the same time, an upper-level disturbance will move over North Texas, generating precipitation. Temperatures on Monday will stay in the 20s to lower 30s. Please bookmark this page so you can follow all future forecasts as I continue to analyze all data. → What’s the difference between a Watch, Advisory, and Warning? There are no changes to the forecasts that I have been providing since Thursday. In fact, those who know my forecasting style know that it’s like pulling teeth to get me to commit to a winter weather event 4+ days in advance. It’s not that I’m not watching the situation behind the scenes prior to that (and I have been watching this storm for nearly a week). The reason that I do not like to publicize the threat so far in advance is because even in 2015, forecasts to change and I like to mitigate hype and avoid crying wolf. When I posted my first forecast back on Thursday, I stressed that this would be a freezing rain and/or sleet event because of the way the atmosphere is evolving. There will not be any snow in D/FW with this storm system, and nothing has changed since my first forecast update. The freezing line is approaching the metroplex (as of 4:30 pm), as indicated in all of my previous forecasts (falling below freezing in the sunset to 7 pm time frame), as the shallow Arctic airmass invades North Texas. The current round or precipitation will gradually exit to the east, but some the rain may mix with or change to sleet on the back side of the precipitation shield. I am noticing an increase in precipitation coverage to the west (between D/FW and Abilene) as of 5 pm, so I will have to keep an eye on that as temperatures fall below freezing this evening. Eventually, this current area of precipitation should exit to the east, leaving just freezing drizzle for a few hours until “round 2” kicks in. As the second round of precipitation approaches, sleet will increase in coverage overnight. Again, the second round of precipitation will be sleet and there will not be any snow (despite rumors on the internet). The sleet may be heavy at times Monday, and I expect conditions to deteriorate throughout the morning. I believe the base accumulations of sleet (i.e., the general average) to be in the range of .50″ to 1 inch. However, I am seeing some conditional instability in the thermodynamic profiles on Monday, which suggests the possibility for convective elements (i.e., thunderstorms). Just like summertime thunderstorms, predicting exactly where those bands will set up is difficult. The areas that see convective activity tomorrow (Monday) could receive an additional half inch to one inch of sleet on top of the base average. This means that some folks could see 1.5 to 2 inches of sleet. The most favorable area, as it looks now, for thunderstorms and bands of enhanced sleet is from Dallas/Fort Worth northward to the Red River. I am still forecasting HIGH temperatures on Monday only in the mid to upper 20s. As I posted last night, this will break a record for the coldest high temperature ever recorded on February 23 (previous record is 32º set in 1914). Additionally, since records began 116 years ago (1899), there have only been 5 occasions with a high temperature below 30º after February 18th. Please follow all future updates. I will begin to post more frequently as conditions deteriorate. You can also use the *free* tools that I provide on my website, including interactive & predictive radar, satellite loops, weather maps, interactive temperature/data displays, and forecast discussions. Temperatures at 4:30 pm Sunday 2/22. Freezing line moving south, on schedule. [Winter Storm Warning] North Texas [issued Saturday 2/21 3:30 pm] A Winter Storm Warning has been issued for Sunday night through Monday for areas along and northwest of a line from Comanche to Dallas to Sherman. This includes the entire DFW Metroplex. The Winter Storm Watch continues for areas south of the Warning to a line from Lampasas to Waco to Athens. It’s in the mid 60s right now (6 am Saturday 2/21) at most locations, but a cold front is entering the metroplex and temperatures will fall quickly into the 40s after the front passes. I expect the entire metroplex to be in the 40s by 8 am. Northwest winds may gust to 30 mph through mid-morning. Temperatures this afternoon should rebound to the low/mid 50s. The second front (an Arctic front, discussed in the very first update on Thursday) will move through N. TX tomorrow (Sunday), with temperatures only in the mid 40s early and falling through the 30s during the day. I expect rain to develop tomorrow, then change to freezing rain/sleet tomorrow night. A significant winter weather event is developing for Monday (2/22), with problematic sleet accumulations. 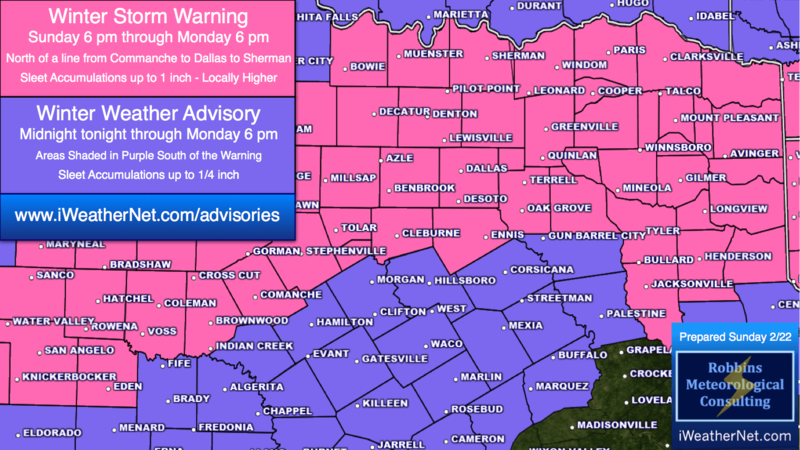 At this time, I am forecasting sleet accumulations on Monday to be in the range of .50″ to .75″. There may also be some thunder within convective elements. Thorough analyses of the vertical thermodynamic profiles through Monday continue to indicate that sleet will be primary precipitation type, but the precipitation type may oscillate between sleet and freezing rain throughout this event. There will NOT be any snow. The high temperature on Monday will only be in the mid 20s. It doesn’t matter if we’ve had warm weather recently when temperatures are in the mid 20s. Pavement (roadways) cool very efficiently when ice (sleet) falls on them. When temperatures are in the mid 20s, the roads WILL freeze. I have posted my latest forecast to the website and I will continue provide updates as I analyze the data. 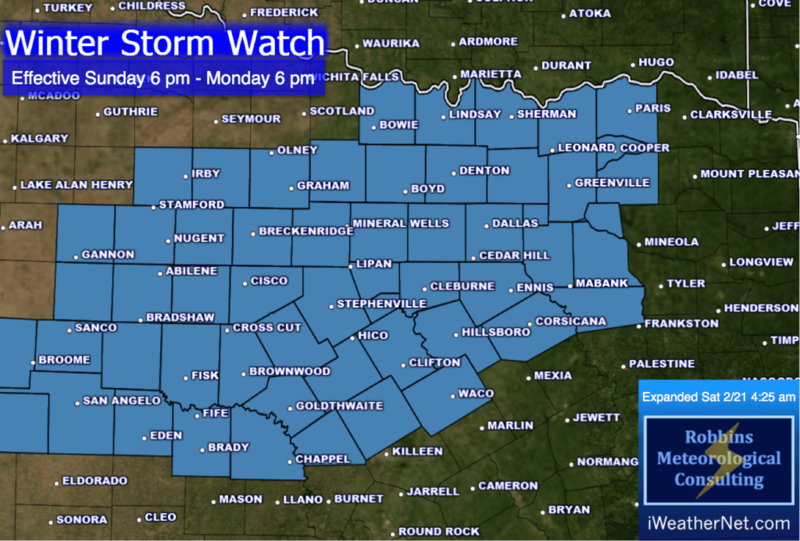 A Winter Storm Watch is now in effect for North Texas, including the entire DFW Metroplex, effective Sunday night at 6 pm through Monday at 6 pm. I will continue to update this page with my forecasts as this storm system evolves (it doesn’t even exist yet!). It’s too early to go into specifics, but it is time to start thinking about the potential for problematic icing in North Texas, including the Dallas/Fort Worth Metroplex. This event is still 4 days away, but I wouldn’t be surprised to see a Winter Storm Watch issued by Saturday if the atmosphere continues to evolve as I foresee it now. Leading up to the event, two cold fronts will move through North Texas. The first front will move through Saturday night, following a very nice day in the mid 60s. On Sunday, temperatures should stay in the 40s as overcast thickens. A second, stronger surge of Arctic air will move in Sunday night, with temperatures falling into the 20s by sunset Sunday (or shortly thereafter). At the same time, an upper-level disturbance will move over North Texas, generating precipitation. Careful and thorough analyses of the vertical thermodynamic profiles indicate that the upper levels will be too warm for snow. Rather, a shallow sub-freezing layer near the surface points toward a freezing rain/sleet event [these determinations were made using all available data up to and including Thursday 2/19; the thermodynamic profiles may change with future data]. With precipitation on Monday, I have a hard time believing that temperatures will rise out of the 20s. When temperatures are in the 20s, roadways (especially bridges and overpasses) can freeze, irrespective of “recent warm weather”, particularly if the precipitation type is sleet (ice falling and melting on roadways causes the pavement temperature to cool very efficiently). There are a lot of details that I have yet to work through, and it will require additional data & analyses before I can go into specifics. Please bookmark and follow this page for future updates (and graphics, which will be prepared soon). I will be devoting the weekend to this event, poring over enormous amounts of data, which will be very time consuming. It takes a lot to convince me to mention winter precipitation 4 days in advance, so that may say something about my level of concern regarding this particular event. If the data remain consistent over the next couple of days, I wouldn’t be surprised to see a Winter Storm Watch issued for much of North Texas. With the next model suite, I will prepare some graphics and make a first attempt at nailing down some specifics.